Matching ladybugs one-to-one with leaves. Give children an uneven number of leaves and ladybugs - match them, ask questions such as: Are there enough leaves for each lady bug to have one? How many ladybugs do not have a leaf? etc. 5 Little Ladybugs rhyme with 5 ladybugs, in b/w for children to “read”, count and color. 5 Little Ladybugs rhyme alone in b/w with space for children to draw the ladybugs. 5 Little Ladybugs rhyme with illustration in color, for children to “read” and count. 5 Little ladybugs rhyme and illustration in b/w, to “read”, count and color. 5 large ladybugs in color, to cut out. Use for counting or make stick puppets by taping a craft stick on each. Use as a teaching tool when presenting the rhyme. 5 large ladybugs in b/w, to color and cut out. Use for counting or make stick puppets by taping a craft stick on each. Click on a resource to read about it and see more pictures.​ Packs for Members are labeled. Match upper and lower case alphabet letters, with a ladybugs theme. 31 pages. $3. FREE TO MEMBERS in the membership area on the Ladybugs theme page. 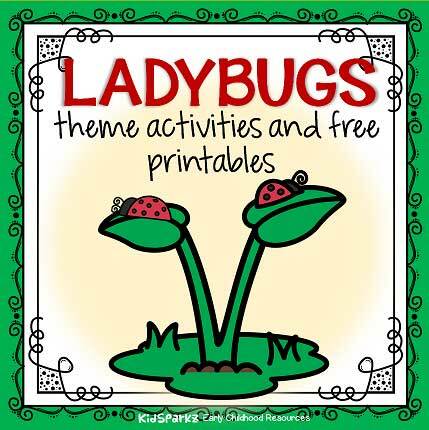 LADYBUGS theme pack for preschool and pre-K - 43 pages.